In the age of Social Media and online selling spaces, is it easier to downsize when going fulltiming? Chris Guld tells about her own experience with going from a house to an RV. We sold our house in 2003 and moved into an RV. First, we packed the RV with whatever we needed. When that was done, everything else had to go! 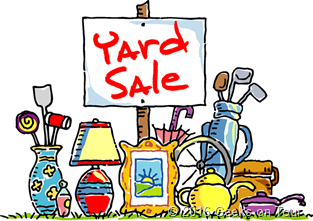 We had garage sales, we took load after load to Goodwill, and we used eBay to sell anything we thought had value. I can’t say it was easy, sometimes it was gut-wrenching, but when it was done we were free. Free to go where we wanted and do what we pleased. We didn’t have to spend time anymore just taking care of our stuff. That was a long time ago for us. 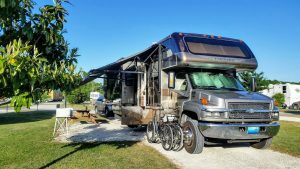 Our friend Debby recently became a full-time RVer and went thru a similar process using eBay. Today, there is also the option of Craigslist, and even Facebook. I could tell when Debby was hard at work downsizing because you’d see Facebook posts of her possessions. How brilliant, I thought, to sell your most treasured possessions to your friends. They may even be familiar with the items, and they already know and trust you — trust is key. Facebook didn’t exist when we started. Full-time RVing means that Everything you own is with you. I asked her about how she decided when to use eBay versus the other options and she said it had to do with value and weight. Value I get, but weight? She explained that shipping is a major consideration with eBay items, and you’re more likely to sell items if you offer free shipping. Ahhh, got it. I think I do remember selling a couch using eBay, but I had to list it for buyer to pick up locally. Today, I might use Craigslist instead as it is aimed more at local readers. It’s not easy to get rid of all your stuff, but you’ll feel so light afterward! You’ll only wonder what took you so long to do it.